Star Trek: The Next Generation was pretty pleased with itself when it came up with the Borg, but Doctor Who had beaten it to the punch by a couple of decades, with a race of cyborgs who were once human, who have their minds altered to remove all motives besides serving their race's overriding goal of conquest, who convert their enemies into more of themselves - mind you, the Borg did come up with "futile," while the Cybermen had the similar but less catchy "resistance is useless." Give the Borg a consolation point for style, I guess. "They were. Until they had all their humanity taken away. It's a living brain jammed inside a cybernetic body, with a heart of steel. All emotions removed." 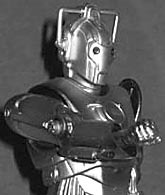 I always liked the Cybermen more than the Daleks - even on the old BBC budget, which usually limited the Cyber Race to four guys in wetsuits spray-painted silver with wobbly helmets and lace-up boots, there's something immensely chilling about an enemy that assimilates, rather than just kills. Like zombies and the pod people from Invasion of the Body Snatchers and, yes, Borg, they undermine the fundamental psychological defence mechanism of defining a struggle as "us" versus "them" - they can turn us into them, meaning there's nothing beyond their reach, not even your own psyche. The new Cybermen, like much of the revived Doctor Who, are a mix of old and new. 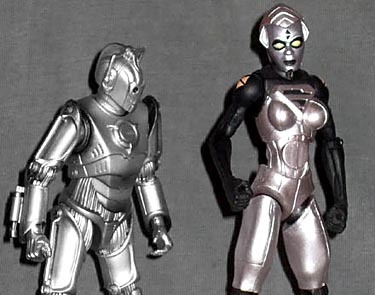 Instead of shiny silver paint, they're now brushed steel, sleek and grim, and their armoured bodies have a curvy, art deco influence, drawing vaguely on classic sci-fi robots like Maria (and her descendant, C-3PO), while still retaining enough of the cold, ramrod-straight mechanistic design to be intimidating. Echoing the late-classic Cybermen (Cyberneomorph) they sport armoured chests over a flexible body sheath layered with tubing, though the armour now extends along the arms and legs as well, and of course the handlebar antennae are there, along with the characteristic face, harking back to the early Troughton-era Cybermen (CyberTelosian), with their mournful mouth and blank, round eyes with a single "teardrop" sculpted below each one. The action figure reproduces all of this marvelously. The sculpt is very capable, on both the flat armour and more intricate tubing beneath, with especially good work in properly separating the pistons on the biceps and thighs - it's the kind of detail that a lot of toy lines might have fudged by making them a full part of the limb, without bothering to sculpt in a separation. All the artistic lines of the body are presented faithfully, and in the 5½" scale of the Doctor Who figures, the Cybermen tower appropriately, a full 6" tall. The best feature of the figure's appearance, though, is the silver paint - the colour, depth, and reflectivity of the "brushed steel" plates is just right, making for a genuinely convincing action figure. There isn't much else to speak of so far as paint goes - the eyes and cannon barrel are painted black, and the hands, elbows, and shoulders have been given a moderate black airbrush to weather them a bit, which looks quite good. I wouldn't have minded seeing a similar effect applied to the tubing on the midriff and hips, but its absence isn't felt too keenly. The Cyberman is one of the better articulated figures in the Doctor Who range, and indeed lacks only a single joint to otherwise have been perfect. It has a balljoint neck, hidden inside the armour at the base, balljointed shoulders, pin elbows and peg wrists, a shallow balljoint sternum, balljoint hips, pin knees, and balljoint ankles. The sternum joint is very tight, only really capable of a small amount of torso twist, but it can help give a little extra body language to a pose. The ankles are especially welcome, and with the big heavy feet they give the figure a lot of stability. 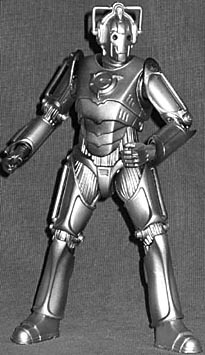 The missing joint is some kind of upper forearm swivel, to allow the Cyberman to raise its arm to fire with the blaster on top of the limb, rather than the side. It's by no means a huge deficit in the figure, but as I said, had it been there this would have been pretty much perfect. The Cyberman doesn't come with any accessories, but then again, they rarely use any - a Dalek smasher rifle might have been nice, but that's not really a Cyber weapon, so it's no big deal (the carded Mickey Smith figure has such a rifle, though). As with several of the Doctor Who figures, the decision to keep costs down by omitting accessories (as well as the initial decision on the slightly smaller 5½" scale) means that a small amount of army-building isn't beyond the grasp of the average collector. All in all, the Cyberman is a really good figure, and as one of the Doctor's iconic enemies, any fan of the show should be well pleased with it.